As you read this, I'll probably be sipping mint tea on a rooftop overlooking the Jemaa El Fna after wandering the souks and visiting mosques. This week I am off to Marrakech - a lively, bustling city in Morocco - and looking forward to the colourful sights, sounds and of course, food. Often holidays are also a channel for discovering local wines, hidden gems which would never make it to the shelves of our supermarkets. I'm not expecting to drink a lot of wine in Morocco, (in fact it'll come as a bit of a welcome break after our recent bank holiday weekends!) and it isn't a country I usually associate with winemaking but on further investigation, Morocco actually has great potential. There are five winemaking regions in Morocco, and within those, a total of fourteen appellations, similar to the French classification. These areas are mostly situated further to the north, with the high mountains and the cooling influence of the Atlantic offsetting the harsh heat. There are an increasing number of grape varieties being planted, though most of the wine produced is red from familiar varietals like Carignan, Cinsault and Grenache, with Merlot and Syrah also featuring. On a recent visit to The Wine Society's Cellar Showroom in Hertfordshire, I was reminded of a wine I hadn't tasted in a while, and I couldn't resist. 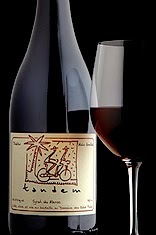 It's a Moroccan wine, made by a Frenchman; Syrah 'Tandem' by Alain Graillot, currently the 2010 vintage. At £12.50 a bottle, it's not cheap, but at 14.5% abv it more than makes up for the price with its gutsy character. Normally producing wines in Crozes Hermitage in the Northern Rhone, Alain Graillot is a widely respected winemaker who teamed up with a Moroccan estate after meeting the owners on a cycling holiday! Peppery and fruit forward, this Syrah has obvious influences from Crozes Hermitage, but has it's own unique character and is more reminiscent of Southern France. Ripe, sweet baked fruit flavours of raisin and cherry, are complemented by a fresh, juicy acidity and sweet, warming spices. Quite frankly, it's delicious and would make an exceptional barbeque wine, or pair with a rich, spicy lamb tagine with apricots. L'anxiété ordinaire peut évidemment causer une dysfonction sexuelle chez les hommes ne souffrant d'aucun problème psychiatrique, mais les troubles cliniquement diagnostiqué comme les peurs paniques causent un individu à éviter des interactions sexuelles et est exposé aux éjaculations précoces. acheter viagra professional est l'une des solution efficace pour un traitement durable de la dysfonction. ce produit est disponible dans les pharmacie en ligne avec livraison partout en Europe !